We Live ‘Where Rabbit and Fox say Good-Night’! 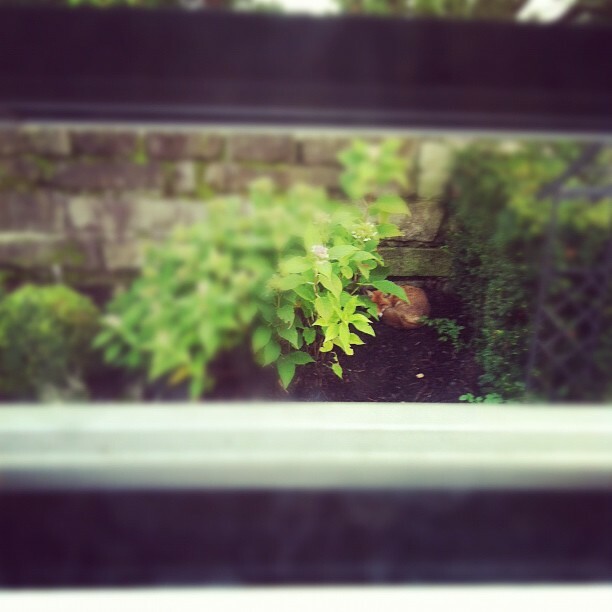 Yesterday, when I looked out of the bathroom window, I saw a fox sleeping in our garden! Dad was so excited he called Mum ‘Come quickly, you gotta see this!’ and so we all saw this beautiful little fury animal being all curled up in a corner. Dad couldn’t believe it: A fox in our garden? Are we living in the country? Mum said: ‘Must be, because, that’s where the German saying comes from ‘Where fox and rabbit say good-night to each other’ (Wo sich Fuchs und Hase gute Nacht sagen). Later Mum opened the shutters and the fox disappeared. The story isn’t finished yet! When Nilly (our cat, if you haven’t read the previous posts) went outside, he met the fox in another part of the garden. Dad saw Nilly getting all puffed up like a puffer fish, appearing double as large as he really is and was wondering what’s going on. When he saw the fox he got all worried as Nilly obviously hasn’t got any experience with such animals. Mum ran out, said hello to the fox (no, Mum is NOT the rabbit) and he disappeared into the neighbor’s garden. Nilly was still all puffed up and his little heart was racing from what probably seemed to him like a HUGE cat with an even larger FLUFFY tail. This entry was posted in adventure and tagged fox, fox in garden, fuchs und hase. Bookmark the permalink.